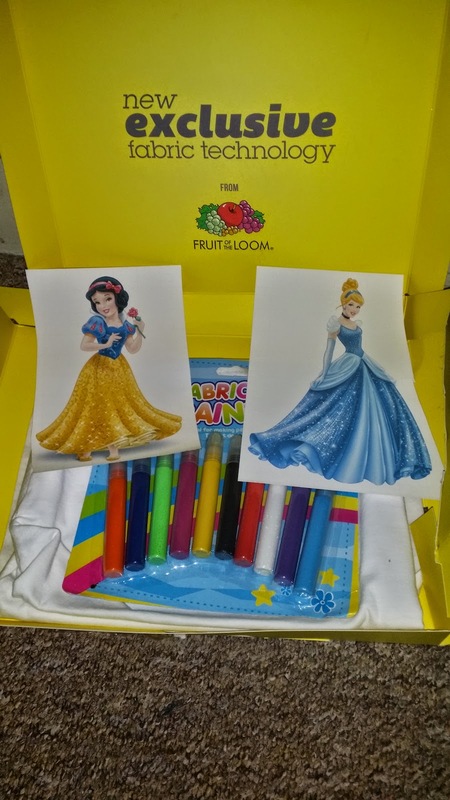 Last week I was looking up fun activites to keep my four year old and her baby sister busy during the half term. My little girls enjoy playing outdoors but obviously,when the weather does not permit we settle for indoor fun play and activity which we of course never run out of. Our lovely home is full of toys, books and so much more to keep little ones busy. However, you probably know by now that with kids nothing beats a new toy or even a new fun activity. 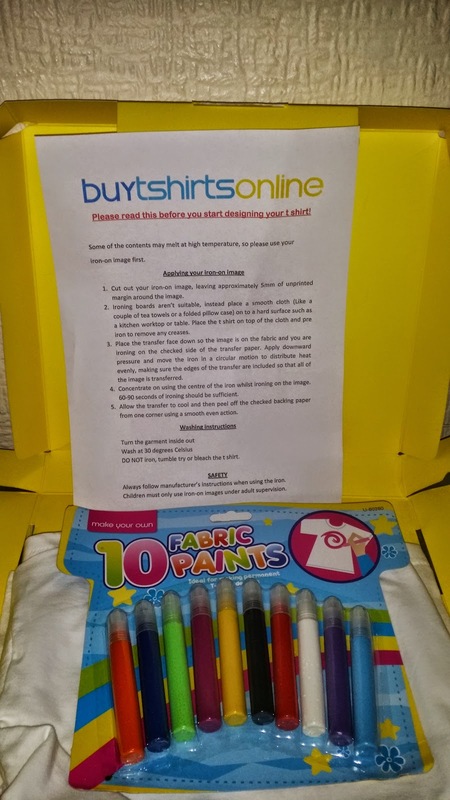 They are usually quick to ''forget'' their old faithful toys and fun activities when a new one surfaces which is exactly what happened when we received the parcel containing the T-Shirt design kits from www.buytshirtsonline.co.uk . 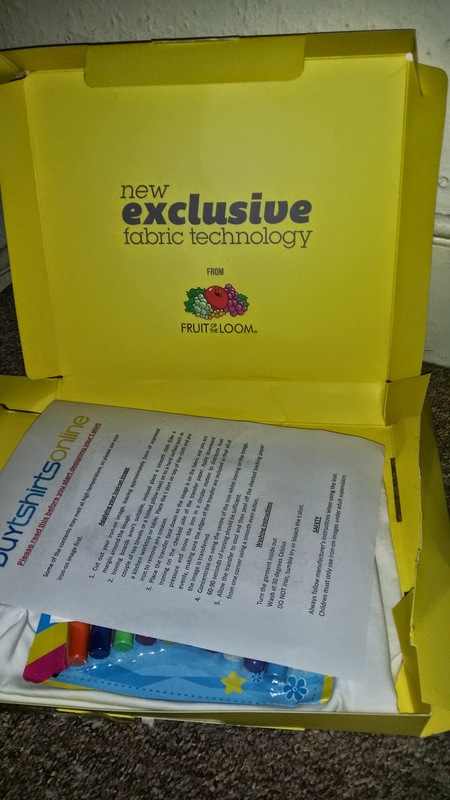 Let me tell you a bit about BuyTshirtOnline before I get down to recounting our experience with the T-Shirt Kit. Its is a family run business that offers quite a range of products from wholesale T-Shirts,ethical and environment-friendly clothing, branded active wear ranging from Fruit of the Loom,Gildan,Stedman and Hanes all at pocket friendly prices.Their services also include digital printing and embroidery with a dedicated in house art department that can transform your ideas and sketches to a professionally designed T-Shirt. They supply local and international businesses irrespective of size and also have a friendly customer service team who will be happy to help If you are not quite sure of which items to order. Charities,schools,sports clubs and associations are also welcome to use their services. See more details on what they offer here . So how did we fare with designing our own T-Shirts? 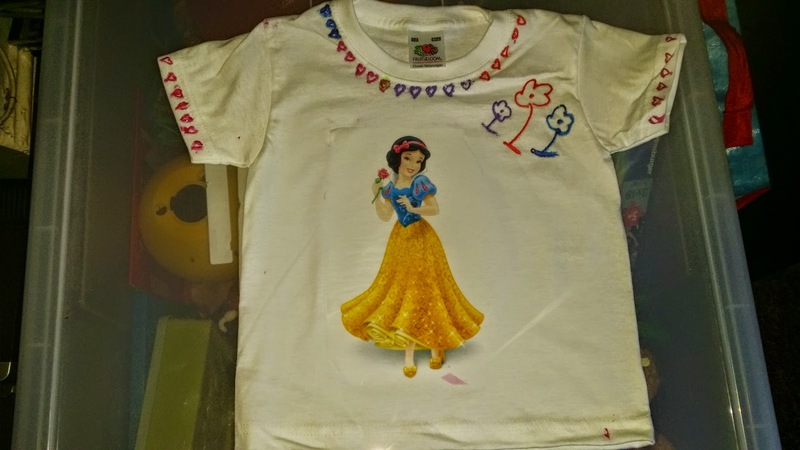 Obviously the T-shirt kit is meant for children so in this case I was happily offering adult assistance to my excited four year old who could not wait to try the T- shirt on once the design was complete. -T-shirt Transfers of our choice. 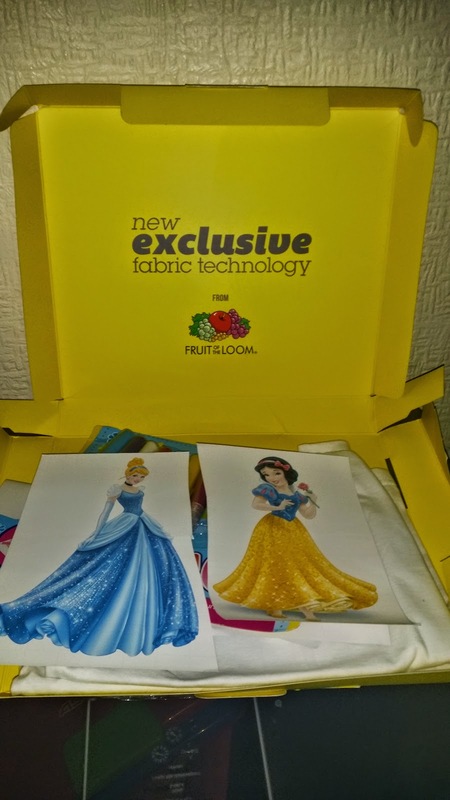 For this, we chose a princess theme because my daughter loves princesses and sees herself as one. There is no disputing that she is because she is my gorgeous little princess! ...and of course, a well detailed information sheet containing instructions on how to design our T-shirts! 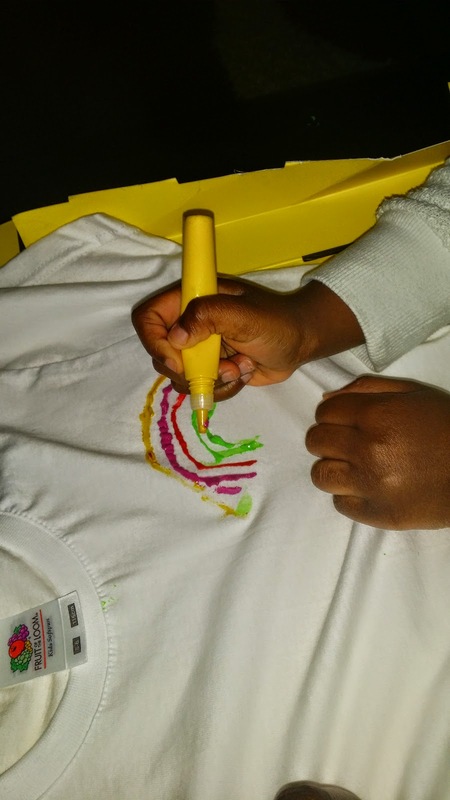 So we started off by drawing some designs on the T-shirts using the fabric pens provided in the kit. My daughter had a preference for drawing rainbows which she absolutely wanted no help whatsoever with. 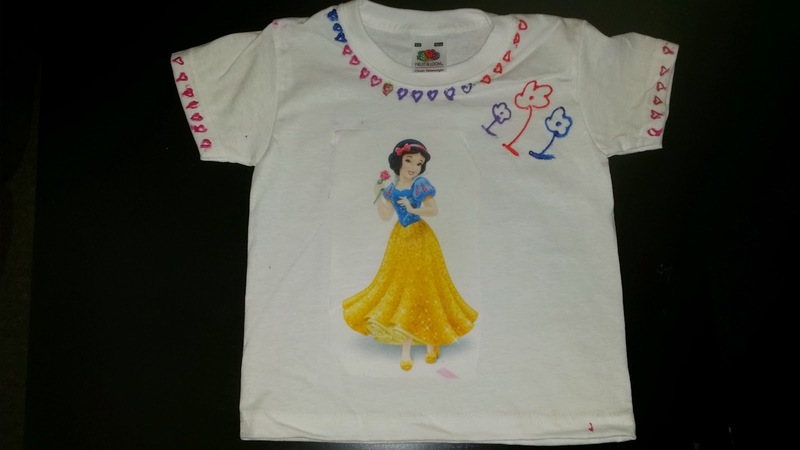 She was absolutely pleased with how her rainbow turned out and apart from a few colour smudges on various parts of the T-shirt I was also happy to see her express her creative side. Colours of the rainbow! Beautiful! Since we had a spare T-shirt in her younger sister's size I also tried my hands out on designing as well. 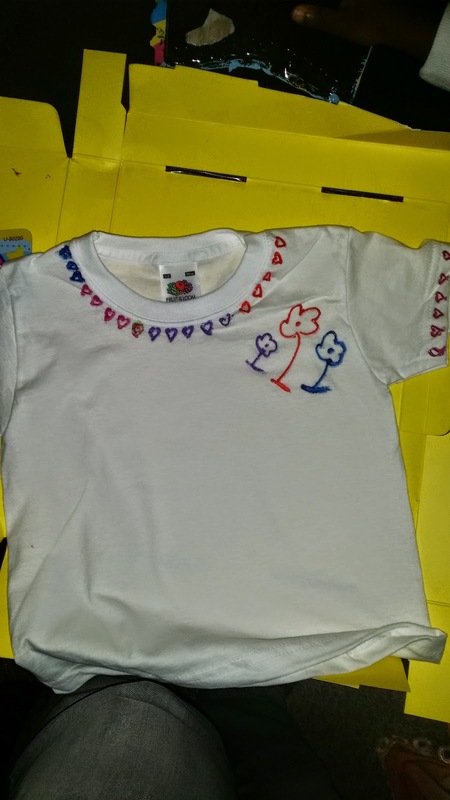 I did a few flowers and heart shaped designs on the spare T-shirt and finished it off by ironing the fabric transfers(face down so the image is on the fabric) onto both T-shirts for about 60-90 seconds, left the T-shirts to cool off and then carefully pulled off the checked backing paper (which the image was placed on) revealing the Princess. Have a look at the completed designed T-shirts below. 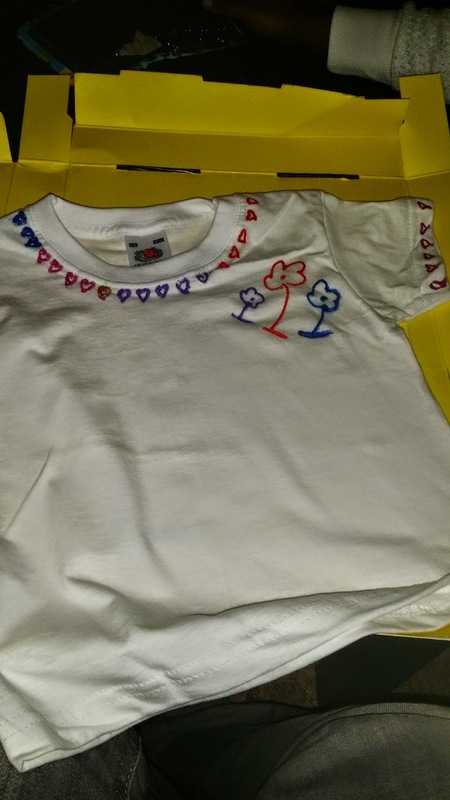 My daughter absolutely enjoyed getting creative with these T-shirts and to be honest, I really would not describe myself as the most creative mommy but I am absolutely proud of what I achieved with one of these T-shirts. 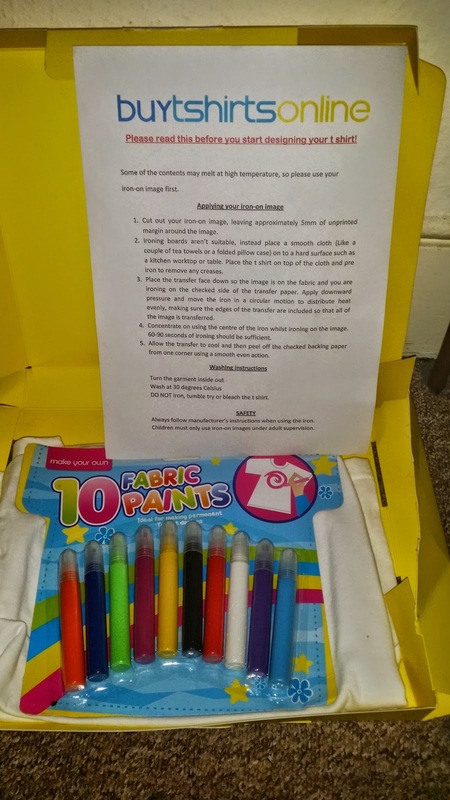 There is so much you can do with these T-shirt design kits, think Long holidays, Half terms, family visits,Stay overs or you just run out of ideas to keep the little ones busy and so much more. 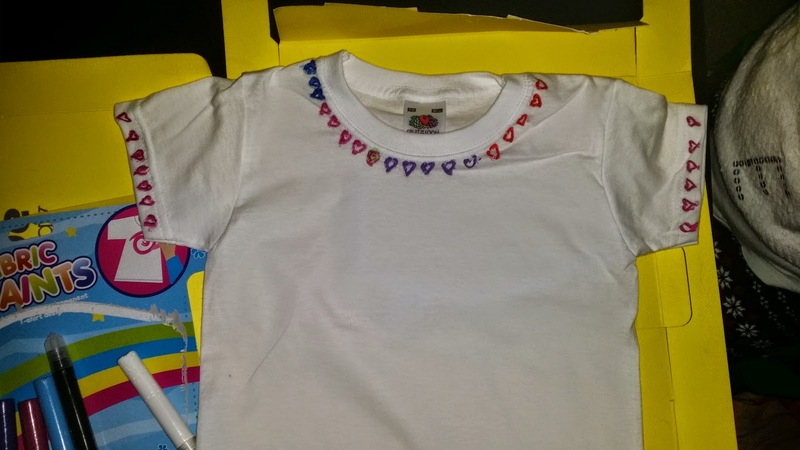 This T-shirt design kit is bound to keep the kids occupied for almost as long as they want, plus they also get to put their creative side to good use, designing T- shirts for the whole family! How cool is that! T-shirts adult supervision is required so the kids can get busy designing the T-shirts whilst an adult takes care of Transferring the designs on to the T-shirt(s) at a later time. 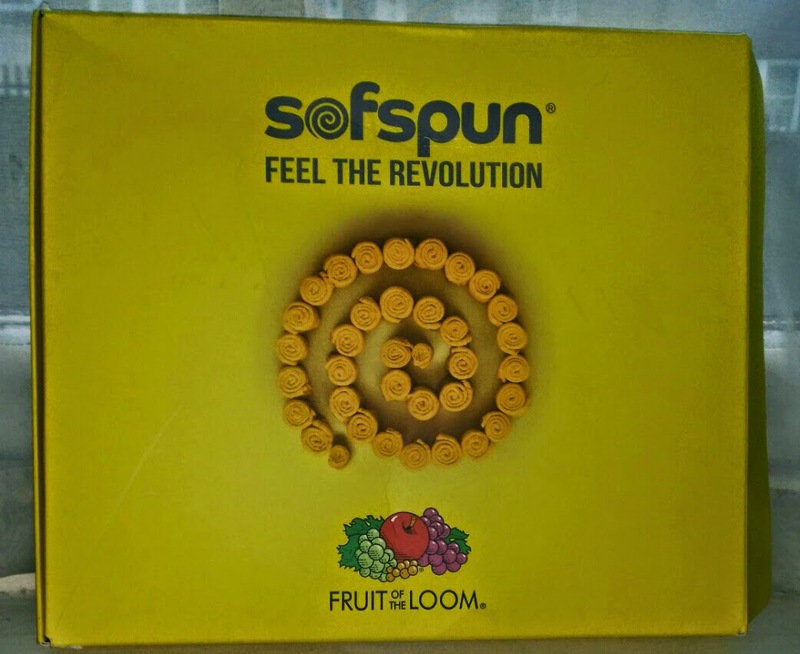 Time to introduce the kids to something new? 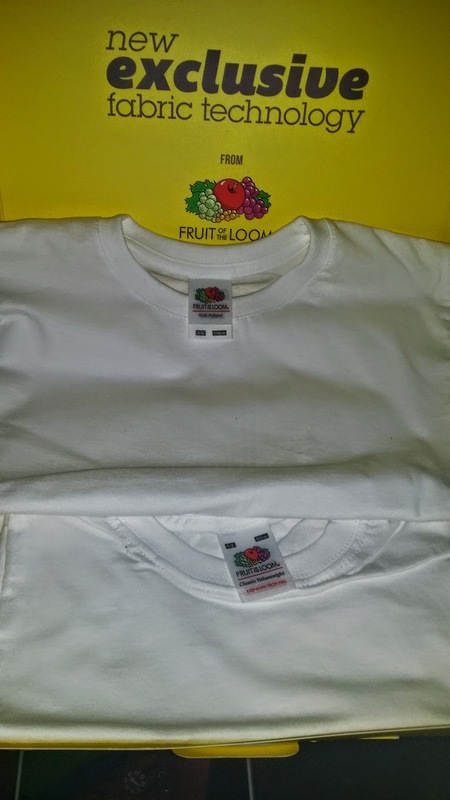 Visit www.buytshirtsonline.co.uk to get your hands on one of these T-shirt design boxes. Thanks Emma, I had to keep it simple as I am not quite great with things like this. My 4yo would absolutely have no input from myself ( so I had to channel my energy to designing her sisters') and she was absolutely pleased to wear it during the half term on a family trip.